Ryan Day says 2017 has been "a good year" despite missing out on a place in the UK Championship final in York. The Welshman lost 6-3 to 2008 champion Shaun Murphy in his first appearance in the semi-finals of a Triple Crown event - the World Championship, UK Championship and Masters. Day's progress put him back in the world's top 16 and guaranteed a place at the Masters in January. "It's been a bonus on the back of this week," he told BBC Sport Wales. "I'm looking forward to it - it's been a while. 2017 has been a good year." Day last competed in the Masters in 2010 and will face Ding Junhui in the first round at London's Alexandra Palace. The 37-year-old from Pontycymmer, near Bridgend, had beaten Murphy 4-2 in their previous meeting in the quarter-finals of the World Grand Prix in Preston in February. But Murphy was in fine form in York, claiming two centuries and further breaks of 89 and 73. "Down to the last four - it's the title we all wanted. Shaun was the better player," Day added. This year, he reached his first ranking final since 2008 at the World Grand Prix, only to lose 10-7 to Barry Hawkins. 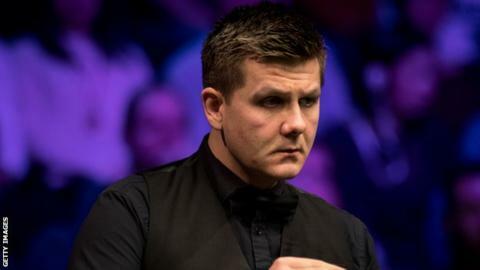 As Wales' only player in the World Championship in April he suffered what he called at the time an "embarrassing" 10-4 first-round defeat by Xiao Guodong. But two months later he beat Stephen Maguire 5-2 in the final of the Riga Masters to win his first ranking title in 18 years as a professional. "After the disappointment in the World Championship I bounced right back in the Riga Masters. It was nice to come home with a trophy. That set me up to move forward from there," Day added. Meanwhile, Mark Williams has pulled out of the Scottish Open, which starts in Glasgow on Monday, because of his wife Jo's illness. Williams was due to face China's Xu Si in the first round. Xu has been given a bye to the second round. The Welshman will take on world champion Mark Selby in the first round of the Masters for a second successive year. Williams lost 6-5 against Selby in this year's Masters.